The morning is crisp, cold and breezy. A medley of bird songs is soothing and sonorous. 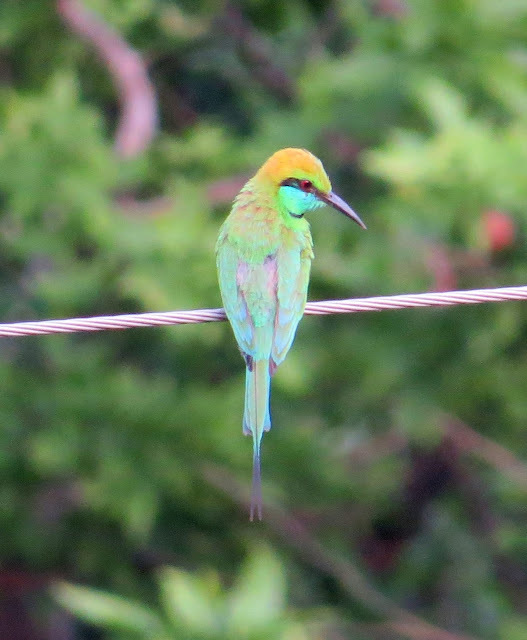 A Green Bee-eater perches on a wire and frequently swoops down for insects. Far on a terrace, two pigeons are busy with each other. Soon the Sun peeps from behind the hill. It looks like a dragon back to spew fire. The hillside is brown and the fields are bare. The river close to the forest has shrunk. It looks more like a brook. 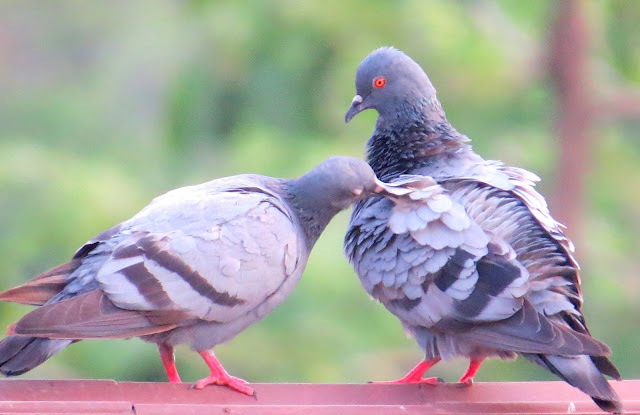 Everyone is waiting for a good monsoon. The heat is maddening. Kids insist on buying ice cream. But ice cream from the market every day is not an appealing idea. 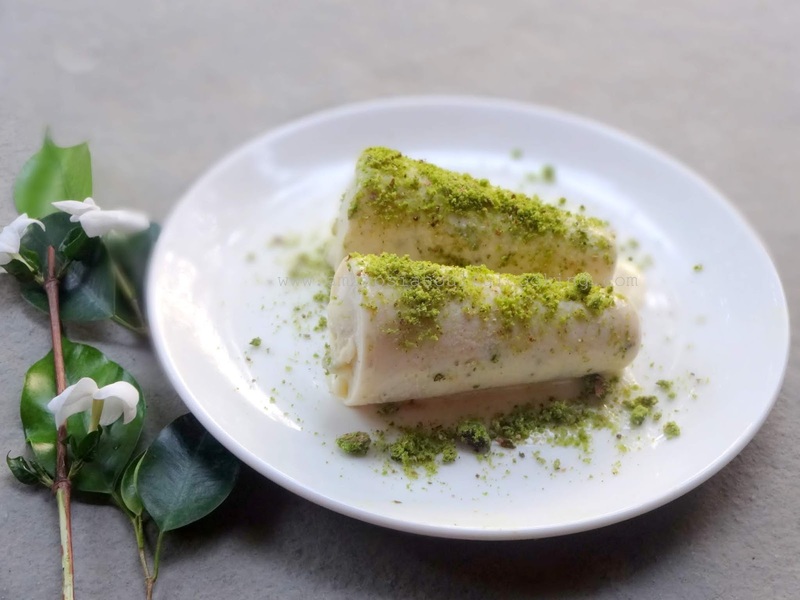 Everyone agreed on making kulfi – our Indian version of ice cream. 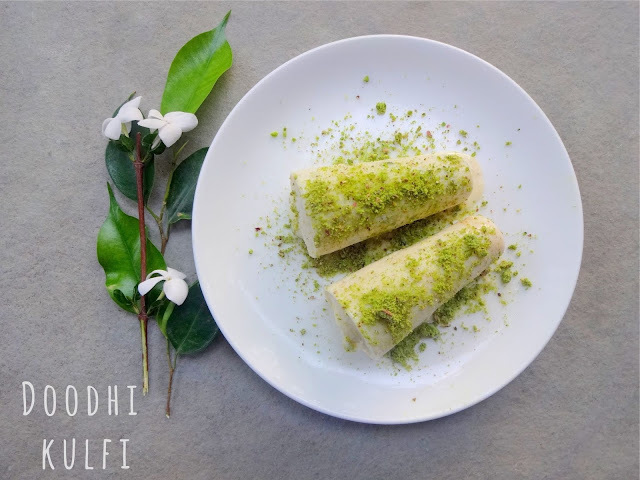 We decided on making Doodhi Kulfi. It is a low-calorie dessert. Doodhi is bottle gourd also known as lauki in Hindi. Strange it may sound but it is amazingly delicious and with doodhi (lauki) as a thickener, it is low calorie, unlike regular kulfi. This recipe is from the book "Great Recipes" a Femina and Spice Board of India presentation published some 25 years ago. Keep aside 1 cup of milk. Boil the rest till it is reduced 1/3 of its volume. Let it cool. Remove the edges of bread slices. Soak in 1 cup boiled hot milk for 30 minutes. Remove seeds from doodhi. Grate and measure two cups. Boil until tender. Squeeze to remove water. Blend together bread, doodhi and sugar. Mix with the thickened milk. Fill the kulfi mixture in kulfi moulds. Keep in the refrigerator for 5-6 hours or until set. Peel, slice, remove seeds and grate doodhi . Measure two cups. Use. Adjust sugar according to your preference for sweetness.